ADONAI I am thankful that you have included us gentiles in Your salvation, but my heart breaks that the Apple of Your eye forgets to look to You. Abba let Your people’s hearts be circumcised and let them cry out to You once more. I ask this in Yeshua’s name, amen. “Moreover, I tell you, whoever acknowledges me in the presence of others, the Son of Man will also acknowledge in the presence of God’s angels. But whoever disowns me before others will be disowned before God’s angels. Also, everyone who says something against the Son of Man will have it forgiven him; but whoever has blasphemed the Ruach HaKodesh will not be forgiven. This passage has vexed me for many years, how can I deny Yeshua and still be saved but if I deny the Ruach I will be destroyed. But then many of us have be abandoned by our friends at one time or another and we have failed our friends at one time or another, yet they have not stopped being our friends. There is forgiveness of that event and everyone moves on. But if we deny the Ruach HaKodesh, moving in our lives then we deny the power of ADONAI as he lets us choose who we will serve ourselves or Him. Denying the very power of God to redeem us from our selfish actions only leaves us to wallow in our selfishness until we are dismissed from His sight forever. I believe this is what Yeshua was speaking about, denying ADONAI’s ability to write His Word upon our hearts so that we will serve Him, is the sin that will bring us to death forever. Lord let me always seek Your Face. Let me write the very words of Torah, Your ketubah between us, so I will know how much I am loved. I ask this in Yeshua’s name, amen. While ADONAI was speaking to Y’hoshua, the cohen gadol, or high priest, at the time of the restoration of the temple it is a good word for us as well. If we hold to God’s commands and immerse ourselves into His Word so that we are living it out day after day as the body of believers, then Yeshua will appear. In that day that Yeshua comes all evil will be removed and will worship together and celebrate just as we practice during this festival of Sukkot, joining under the branches of the trees to enjoy our love for God together. Lord let me see this day and that it comes soon, I ask this in Yeshua’s name, amen. Trust in ADONAI Is all we need, loving God with all our being body, mind and spirit, while treating everyone how we want to be treated. The “Torah expert” knew the answer when he asked Yeshua, it was his follow up question that showed he did not understand what he had just spoken, wanting to redefine “neighbor” to the people he, the Torah expert, picked and not the people that ADONAI put in his path day to day. It is added this religiousness that separates many from the truth of the Word of God. Lord never let my faith get to the point of haughtiness where I look down on others, but always show everyone Your loving kindness. Lord let my trust be as simple as a child, looking only to You for guidance in this life. I ask this in Yeshua’s name, amen. Then the people of the land began discouraging the people of Y’hudah, in order to make them afraid to build. They also bribed officials to frustrate their plan throughout the lifetime of Koresh king of Persia and on into the reign of Daryavesh king of Persia. During the reign of Achashverosh, at the beginning of his reign, they brought a charge in writing against the people living in Y’hudah and Yerushalayim. There is nothing new under the sun. Men who don’t understand our relationship with ADONAI seek to destroy it. They cannot stand a people set apart who can find the joy of the Lord even in the worst of circumstances. Time and again Pharaohs, Hamans, Kings and Hitlers have tried to destroy the apple of God’s eye for their own aggrandizement only to have the hand of God destroy all they have, and the result is all their riches find their way into the hands of God’s people as they rebuild their lives from the latest oppression. Lord soften my heart to the enemies of Your people. Let me pray for them as I would my own family as Yeshua commanded us to do. Let me face the enemies of Your Word with love and a witness that will never deny You. I ask this in Yeshua’s name, amen. The man from whom the demons had gone out begged that he might go with him; but Yeshua sent him away, saying, “Go back to your home and tell how much God has done for you.” He went away proclaiming throughout the whole town how much Yeshua had done for him. Once we have experienced the power of ADONAI through trusting in Yeshua we are required share with others not dwell in that one moment. Though the demon possessed man from Gerasene begged to stay with Yeshua, he went out as commanded through his own community bringing others to trust as well. It is by our testimonies that others will want to seek ADONAI through His son Yeshua. Lord let me lift You up in all that I do so my life is the opening to others as I bear daily witness to You. I ask this in Yeshua’s name, amen. 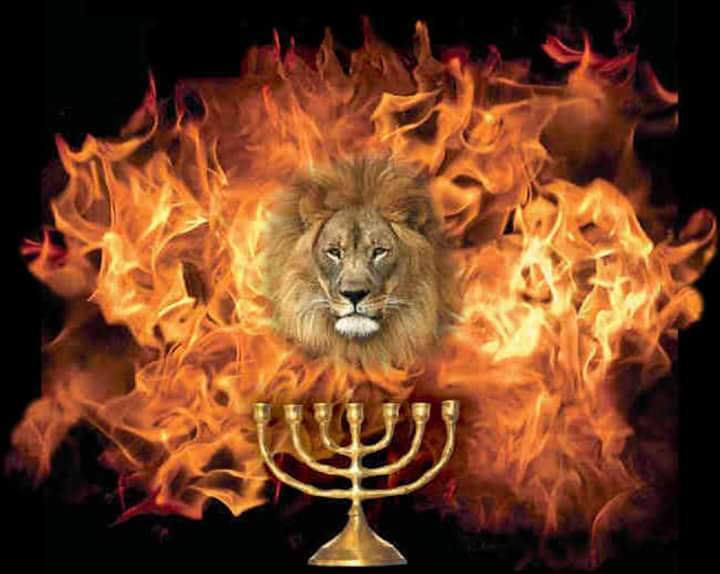 ADONAI-Tzva’ot, my king and my God. I only find true comfort when I am kneeling before ADONAI laying out my praise and pains to Him. I have tried hiding in the bottle and chasing after bad relationships in the past, but they cannot compare to the peace, the shalom I find in Him. I regret that I have let the worries of the times pull me away from spending more time in prayer and soaking in His presence and with His help I will spend more time in the days to come. Lord keep me going as I struggle to keep on Your narrow path. I ask this in Yeshua’s name, amen. But the news about Yeshua kept spreading all the more, so that huge crowds would gather to listen and be healed of their sicknesses. However, he made a practice of withdrawing to remote places in order to pray. There is something to be said for the gathering together in great congregations where the Ruach can move among the people and healing and inspiration among the body of believers happens. Even Sha’ul encourages us to come together as congregations to support one another. Yet Yeshua himself always took time to remove himself from the crowd and pray and worship with ADONAI alone. Without this withdrawing from the noise of the crowd how can we ever hear the still low whisper of ADONAI’s love fill our lives. For weeks now I have struggled as I have been pruned into a new level of prayer that I would have thought at the beginning of summer, was good enough, but how can anything be good enough when I constantly give into the hustle and bustle of the crowds, be it work crowds, worship crowds, friend crowds or family crowds and fail to remove myself from these crowds to seek His face. Lord forgive me for my weak and superficial prayers. For looking for the plaster over the sore but not at fixing the sickness underneath. Lord help me to find the time to spend with You so that I am embolden to share Your Word and shine Your Light into this world. I ask this all in Yeshua’s name, amen. When day had come, he left and went away to a lonely spot. The people looked for him, came to him and would have kept him from leaving them. But he said to them, “I must announce the Good News of the Kingdom of God to the other towns too—this is why I was sent.” He also spent time preaching in the synagogues of Y’hudah. Like Yeshua I must make time for prayer and spending time alone with Him so that I can face the challenges of the days ahead. Lord You have helped me to be faithful in this. This year strengthen my prayers so that please You in all that I do. I ask this in Yeshua’s name, amen. Suddenly, the fingers of a human hand appeared and began writing on the plaster of the palace wall by the lampstand. When the king saw the palm of the hand that was writing, the king’s face took on a different look. As frightening thoughts rose up within him, his hip joints gave way and his knees started knocking together. When ADONAI’s power is revealed it is the condition of our hearts that determine our reaction. In this case as the hand wrote on the wall in full view under the light of the lamp stand, the king immediately knew in his soul that he had offended ADONAI, even though he could not read the words. It is the openness of which ADONAI deals with us that exposes the very core of our sinful nature, yet He has given us a way of reconciliation through the sacrifice of Yeshua so that we might stand in the God’s light forever. Abba let me always see Your hand as You move among the nations. Let me recognize and be able to understand the words You give us like Daniel did. I ask this in Yeshua’s name, amen.